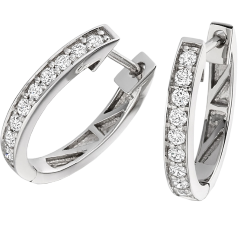 Our diamond hoop earrings are appropriate not only for special events, but also for everyday wear, they dress up both casual outfits and business suits. You can also pick from our diamond drops with clusters shaped like a starburst, snowflake or flower to add a hint of whimsy to your classic elegance. We also offer drop earrings with heart-shape detail that match with our heart-shaped pendants. 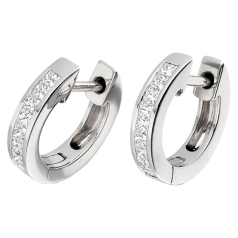 A pair of diamond hoops or drop earrings is also an outstanding gift for any occasion, and will surely win the admiration of the receiver. Our jewellery comes in a beautiful presentation box, ready to be given as gifts. 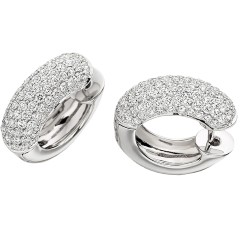 You can choose from diamond hoops and drops made out of 9ct white gold or 18ct white gold. 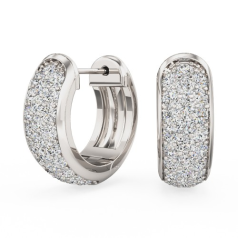 Our diamond hoops and drops feature round brilliant and princess cut diamonds in channel, claw, and pave setting. Some of our drop earrings also have pearls, giving them an extra glamorous look. The high quality diamond hoops and drop earrings we offer are not only timeless fashion accessories, these pieces can in time become family heirlooms, pieces to be passed down to your children. 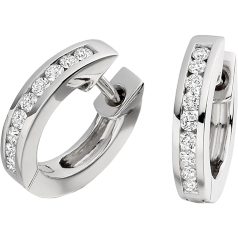 If you are not looking for a big diamond, yet are attracted to brilliance, our dazzling diamond hoops and drops are for you!